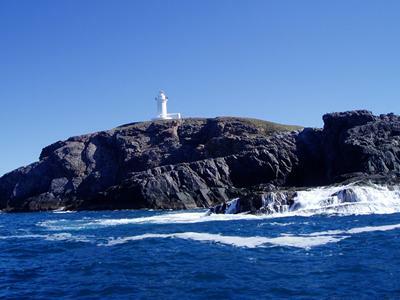 From Coffs Harbour it is a 15 to 20 minute trip out to the island. On the northern side of the island there are a number of dive sites. These are called (from the eastern end) Cleaner Station, Shark Gutters and The Boulders. In reality, these are all accessible on the one dive, but a good dive is to do the first two on the one dive and the third on another. You moor at the third mooring. When you enter the water, head out north and into deeper water. The depth at the mooring is about 12 metres. Gradually it deepens to 23 metres or so. There are some small walls here. Once in this depth, turn left and shortly you will encounter "The Boulders". These are really large rocks. They extend for quite a bit in all directions. You will have noticed before seeing the rocks a flat rock that looks like a glacier running from the shallows to the deeper water. Once amongst the boulders, have a good look around. There are lots of things to see in between and under the boulders. Large schools of nannygai, yellowtail and surgeonfish can be seen. Keep a good look out in this area for Bernie. He is the huge green turtle, at least 1.5 metres long, that lives in this location. 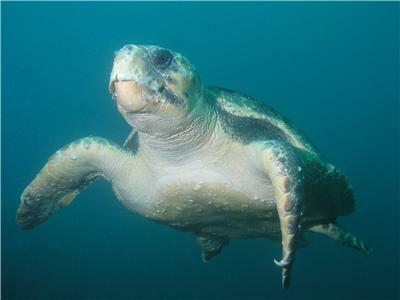 He is very friendly and will not only let you get very close, he will even swim right up to divers and examine them. Fantastic! Another great thing to keep a look out for are the anemones. There are lots of them all around here. There are a number of species. Most of them do not have resident clownfish but some do. 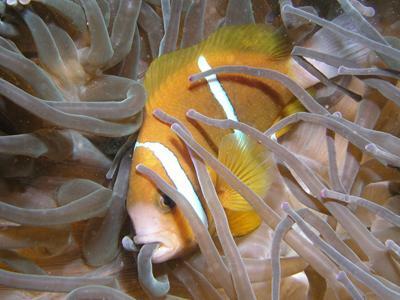 The clownfish include three spotted dascyllus, Clark's anemonefish and juvenile orange-finned anemonefish. There are many more in this area compared to the sites to the east. When in the boulder area, gradually head shallower till you are in the 10 to 12 metre depth. Turn left and head east. You can continue for a while and will cross the main shark gutter (from the Shark Gutter dive). There are lots of bream, more surgeonfish, seapike and yellowtail. You will also see blue tangs, southern fusiliers, wobbegongs, eels, firefish and maybe even coral cod. I have seen a couple of clown triggerfish when diving this area (in 1999 to 2001). If you running out of air or bottom time, head back to the mooring and ascend when ready. we see a lot of wobbegongs and a few yellowtail kingfish. On my dives here I have only had about 10 to 15 metres visibility, but the dives were excellent. The water temperature is about 21°C in early June and late July it is about 18 to 19°C. I have only dived here with Jetty Dive but can really recommend their services. Contact Mike on 02 6651 1611. For more information about Coffs Harbour, see my Coffs article.